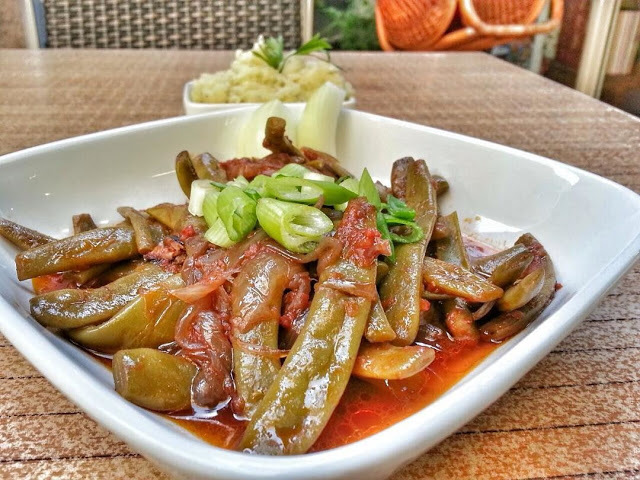 Loubieh bi zeit, a classic Lebanese dish of tender green beans sauteed in tomatoes, onions, garlic and olive oil. Loubieh bi zeit is a healthy vegetarian recipe. 1. Heat the oil in a saucepan, add onions and fry till soft. 2. Add garlic and green beans. Keep frying on low heat for 15 minutes, or till the beans start to wilt. 3. Add the tomatoes, lemon juice, water, salt and pepper. 4. Cover and cook on low heat for 45 minutes. 5. Serve cold or warm and with pitta bread.